PokerNews caught up with Ryan Hughes just after he took down the $2,000 Seven Card Stud Hi-Lo Event and over $175,000 (not to mention the World Series Bracelet). Click here to check out the interview with Ryan, along with all the other videos from this event. On third, Hughes raises and Lee calls. On fourth, Lee bets and Hughes calls. On fifth, Lee bets and Hughes raises. Lee re-raises and Hughes thinks for a bit. He eventually calls. On sixth, Hughes bets his top pair and Lee lays it down. Amazingly, Hughes gets quad tens, which he is holding up during the photo shoot. 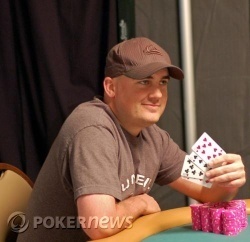 He wins $176,358, the WSOP bracelet and a Corum watch. Min Lee wins $97,461 for second place. It took twelve hands to get there, and Ryan Hughes is our champion. Hand #1-2 - Ryan Hughes takes it on third. Hand #3 - Min Lee takes it on third. Hand #4 - Ryan Hughes takes it on fourth. Hand #5 - Min Lee on fourth. Hand #6 - 9 are all Ryan. Hand #11 and 12 are the final hands - in the next post! The final two are on a fifteen minute break. Ryan Hughes leads with a million in chips, while Min Lee has 360,000. Doug "Rico" Carli gets it all in on third. Ryan Hughes calls. The boat takes out Rico. Raymer's nemesis at this final table, Ryan Hughes, eliminates him. Raymer loses almost all his chips to Ryan Hughes when he can't beat Hughes' kings and nines. Then Raymer splits Rico, Raymer scoops versus Lee, then he chops versus Lee.